Soup and bread- I can't have one without the other! Here, I combine the best of both worlds into golden croutons. I love the flavor of nutty gruyere. It pairs well with the natural sweetness of root vegetables. I blend the soup directly in the pot for convenience, creating a beautiful rustic texture. Cut the vegetables to about ½-inch thick. If you don't have a hand-held blender, puree ½ of the soup with a standard blender. The cheese can be grated in the food processor if you prefer. Fit the machine with the shredder attachment and process. Every couple of weeks, I will shred several blocks of cheese at one time. I keep them refrigerated in ziplock bags, or freeze whatever I'm not using. Any sharp, nutty cheese would pair well with this soup. Try Comte or cheddar. Croutons: preheat the oven to 350 F. Grab a rimmed baking sheet and set aside. Soup: in a large, heavy bottom pot warm the olive oil and butter over medium-low heat. Add the chopped onions, leeks, carrots, parsnips and garlic. Season with salt and pepper. Saute the vegetables until soft, about 10 minutes. Add 4 cups of chicken stock, cover, and bring to a gentle boil. Reduce the heat to low. Simmer, stirring occasionally, until the vegetables are tender, about 25-30 minutes. Meanwhile, prepare the croutons. Add the cubed bread to a small bowl. Drizzle with olive oil and add the chopped sage and rosemary. Season with salt and pepper. Mix well. Tip the bread cubes onto the baking sheet. Sprinkle the cheese over the top. Bake for about 10 minutes. The croutons are ready when the cheese is melted. Remove from the oven and set aside. Using a hand-held immersion blender, puree a small portion of the the soup; the texture should be chunky but not too thick. Add extra chicken stock if necessary. To serve, stir in the chopped parsley. 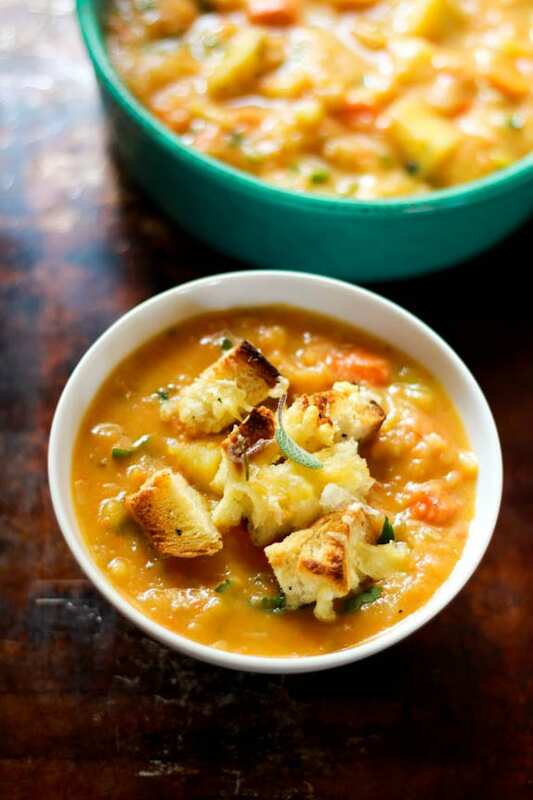 Ladle the soup into bowls and top with croutons.